When the queen of the bugs demands that her army march in even lines, Private Joe divides the marchers into more and more lines so that he will not be left out of the parade. 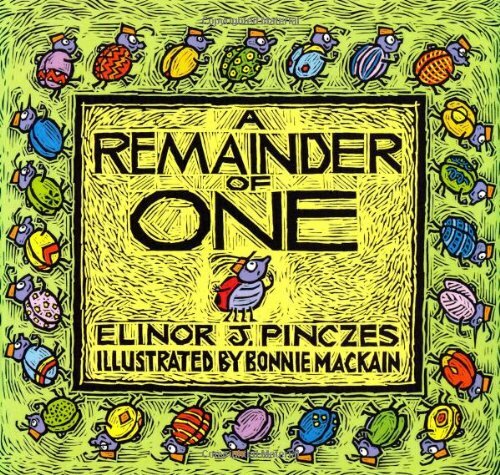 ‘A Remainder of One’ (1995) is a well-known classic story by Elinor J. Pinczes. The story is about Joe, a bug soldier, who gets disheartened as every time he joins in a marching parade with 24 other bug soldiers, he always gets left on his own. They have tried 2 rows of 12 soldiers, 3 rows of 8 soldiers and even 4 rows of 6 soldiers: nothing works until they try 5 rows of 5. The story does a wonderful job in visually demonstrating to very young children what division and a remainder looks like using the array formation. Another great thing about this story is that readers can clearly see how knowledge of division can help meaningfully solve a problem. We can see this story being used by teachers and parents to provide a meaningful and fun context for children to learn about division and remainders using resources, such as counters and Unifix cubes, to represent different total numbers of bug soldiers. This story can also provide a useful context for children to explore the concept and property of prime numbers. All in all, we highly recommend ‘A Remainder of One’ to teachers and parents of children, aged 5+, and the story serves as a perfect extension to another story by Elinor, ‘One Hundred Hungry Ants’, which is also about division, but without any remainder.